Tiny Houses, Sabbath, and a Volvo: How does generosity relate? At my church in the month of May, we've been doing a series on Generosity and Giving. I'm guest preaching this weekend and I’m going to continue that message of how generosity can transform, but specifically, we’re going to look at the concept of minimalism to both transform our priorities and allow us to be more generous with our resources of time, money, and our gifts. We’re also going to look at how Sabbath rest can give us perspective on life and giving. This is a blog version of my talk with links to resources and extra thoughts. By now, you’ve probably heard about the tiny house movement: where people (who aren’t usually carpenters by trade), choose to leave their large, cluttered houses to move into a 200 ft. home on wheels (which is usually to bypass building and zoning laws) that they often build themselves. They can do this affordably and get out of debt while also living in a more environmentally friendly way. A review of a Tiny House documentary that used to be on Netflix says that the tiny house movement “challenges the notion that bigger is better.” The documentary, “Tiny: A story about Living Small” is from 2013 and follows one person’s journey through building and moving into his tiny house. There is a bit of fascination with these houses in our culture. This documentary is one of many. There are lots of resources for you to go out and do this yourself. I’m fascinated by it. By some accounts, I think it's brave. By others, I think it can be silly. I know I’d never be able to do it- mostly because I’m an artist (which means I hoard lots of materials in case they’ll be good for an art project) and because I like cooking (which means I prefer more than a tiny-house kitchen). But I’m fascinated with other people’s fascination with the movement. I think we recognize in ourselves that we have too much stuff. 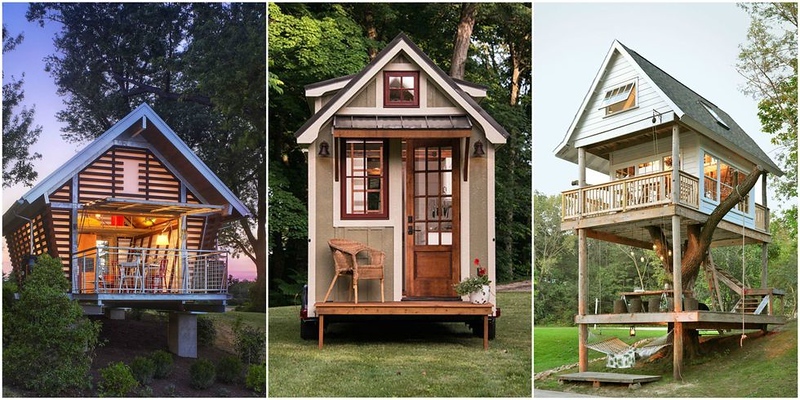 The move to a tiny space forces the tiny home owners to make different life choices and those choices are really interesting. It's a journey of unbecoming. A journey of unbecoming everything that our culture has told us that we need to earn, become, own, use, do and play with. But a journey of unbecoming is what I think one of the most significant threads of the Bible is about - so there is something spiritual about the decision to walk away from the things that hold us down. Our scripture today was one of the most memorable for me - one of the first times I enjoyed a historical-feeling lesson being applied to the message and then the message became something more meaningful because of it. I remember the speaker saying that the “eye of the needle” was a tiny gate inside of the larger gate of the city. When the city was closed down and no guards were present, one could leave his or her camel outside of the city for the night and all of the belongings and only fit themselves through the smaller gate in exchange for safety within the city. This would indicate that one needed to abandon material things in exchange for safety, making the choice for a rich young ruler difficult who might treasure material objects. The Bible is full of stories of resistance. This scripture shows us Jesus turning commonly held beliefs on their heads. Those beliefs are sometimes so caught up in our earthliness, right? Sort of like owning stuff. We often think or say, “I need” but sometimes it takes a bit of turning things upside down to remember that we don’t really need as much as we think we do. In fact, in Matthew 6: 25-34, Jesus is going over related matters. Do Not Worry 25 “Therefore I tell you, do not worry about your life, what you will eat or drink; or about your body, what you will wear. Is not life more than food, and the body more than clothes? 26 Look at the birds of the air; they do not sow or reap or store away in barns, and yet your heavenly Father feeds them. Are you not much more valuable than they? 27 Can any one of you by worrying add a single hour to your life[a]? 28 “And why do you worry about clothes? See how the flowers of the field grow. They do not labor or spin. 29 Yet I tell you that not even Solomon in all his splendor was dressed like one of these. 30 If that is how God clothes the grass of the field, which is here today and tomorrow is thrown into the fire, will he not much more clothe you—you of little faith? 31 So do not worry, saying, ‘What shall we eat?’ or ‘What shall we drink?’ or ‘What shall we wear?’ 32 For the pagans run after all these things, and your heavenly Father knows that you need them. 33 But seek first his kingdom and his righteousness, and all these things will be given to you as well. 34 Therefore do not worry about tomorrow, for tomorrow will worry about itself. Each day has enough trouble of its own. When you go to his page, the first reading paints a picture of how we have clutter all around us and must spend time daily dealing with that clutter. Joshua tells the story of how his life was transformed. Joshua’s blog goes on with facts: Today Americans consume twice as many material goods as we did fifty years ago. The size of the average American home has nearly tripled in size over the past 50 years and now contains about three hundred thousand items. Our stuff has even spilled outside our walls. Due to our garage clutter, 25 percent of people with two-car garages don’t have room to park cars inside and another 32 percent have room for only one vehicle! And I haven’t even mentioned the 10% of us who rent offsite storage. He says: At the time, the concept of purposefully owning less stuff was foreign to our worldview—especially being raised in a society that relentlessly promises happiness and fulfillment in our next purchase. But, for some reason, the idea of owning less sounded oddly attractive. The surprising solution you’ll never find in an Ikea catalogue, plastered on a billboard or featured on a Google banner ad is to own less stuff. Owning less results in less cleaning and organizing and managing and repairing. But the benefits go far beyond that: Owning less sets you free to pursue your dreams and become the person you desire to be. In his interview on the Rob Cast, Joshua reflected on the adage, The More Stuff You Own, The More Your Stuff Owns You Joshua doesn’t feel that a tiny house is necessary for everyone. It's not a minimalist competition. (He, in being part of minimalist groups, has learned of people who compete to own the least amount of things. “All of my belongings can fit in a backpack.” or “I only on 50 things.” “Oh Yeah? I only own 35 things.”) He was formerly a pastor and needed to be able to host small groups. He needed a home that could comfortably accommodate people for those kinds of events. For his family, it was always about how focused and intentional and clean and pure you can get your life so that you have more time time for the things that mean more. A journey like this is a complete change of our philosophy - our lifestyle and our focus. And it is not overnight. No. Just like Jimmy said last week - He shared the story of Costos - that first $100 that he gave away was hard. But God changed his heart and giving slowly became part of how he oriented his life. If we can slowly allow God to change us. If we start to just sit and reflect on what we don’t need anymore. If we start to read articles about strategies to minimize our clutter or objects we don’t need from our lives or how to incorporate special objects into our lives so that they aren’t packed in boxes in the basement. How to start with ourselves (and not start by going through the kids’ toys or our husband’s stuff, which is sometimes an appealing place to start! :) ) but by starting in our own hearts and with our stuff. I know that I don’t want my stuff to own me. When I was talking about this sermon with my husband the other week, he immediately went to something that Dave Ramsey references a lot from Proverbs: “The Borrower is Slave to the Lender” which may not seem on first glance that its connected because in these instances we already own the stuff, but when we start to compare ourselves to others (so easy to do in this Instagram culture) and feel that we need more of something to compete to to give our kids the same advantages as another family’s kids, we start to get in over our heads quickly and lose perspective and before you know it, we are in debt and working so hard just to live paycheck to paycheck, never feeling like it's enough. We become a slave to stuff and to money. God doesn’t want that for us. God actually tells us that we have to choose. No one cans serve God and money or stuff that money can buy. We don’t want our stuff to own us. We want to belong completely to God. Letting go of some of our material possessions can begin to unlock us from some responsibility to get to give more generously of both our time and our money for God’s Kingdom. Exodus 23:10-12 10 “For six years you are to sow your fields and harvest the crops, 11 but during the seventh year let the land lie unplowed and unused. Then the poor among your people may get food from it, and the wild animals may eat what is left. Do the same with your vineyard and your olive grove. 12 “Six days do your work, but on the seventh day do not work, so that your ox and your donkey may rest, and so that the slave born in your household and the foreigner living among you may be refreshed. These laws are called the Shmita Laws. (everyone say that word out loud right now) These laws are concerned with agriculture and letting the land lie fallow as described in the scripture above. The Bible reviews them in several places. The idea is that just as the Sabbath punctuates the week and allows for rest, so too the land and all creatures deserve a rest. In the scripture, we see that not only is the land getting a rest but the vegetation or regrowth from previous plantings may sprout up again in that seventh year and that allows the poor among the people of Israel along with animals to get food from the land that year. For both the week and for the years, it’s all a 6 to 1 ratio. The Shmita laws also dictated (which Jimmy referenced last week) how everyone had to give annually in the harvesting years to build up a store of food for the 7th year that everyone in the community would share. Shmita laws also reference another great word from Jewish culture - Kadosh - go ahead and say that to your neighbor now. Kadosh means holy but it means specifically a “set apart holy” rather than a better than you sort of holy. It encapsulates the idea that when something is different than the norm, it becomes set apart. It is referenced in Isaiah 6:3 which says “Holy, Holy, Holy is the Lord of hosts: the whole earth is full of his glory.” It implies that the realm of the holy is completely set apart from the common or the habitual. Shmita laws are kadosh because that 7th year is set-apart. Its something that God’s people must prepare for. They have to spend 6 years preparing for that year of rest - to have enough to eat for the whole community. It can’t just happen with no rhythm in place. Practicing our Sabbath is like that. Developing a flow and a rhythm to spend time away from culture and the busyness of life (I don’t even necessarily mean church here in this building when I say time apart but it can be part of it!) You see, not all time is exactly like all other time. Setting aside a specific time isn’t what makes it more holy, though. No. It sets it apart from other things to sort of help our brains adjust. A Sabbath isn’t holy because it exists but because of what our spiritual journey can become or grow to when we learn to take a step back. “Did you ever just feel or notice your brain buzzing from all of the things you have to do in your day? “Where you just know you can’t stop -its a natural instinct to just keep pushing forward to work through it and hope for light at the end of the brain busyness tunnel? But the problem is that the brain busyness is like a drug - like a brain race dependency. Rob Bell describes this as an addiction to a pace of life. Withdrawals will be hardest at first, Rob warns - not unlike my sons’ adjustment to getting a full night’s sleep - getting up many times trying to stay in the brain buzz phase rather than allowing rest to care for our bodies. See, the answer to our turmoil might not be the thing you think it is - getting to the next point or achieving the next milestone at work. Sometimes the answer can come in the rest. So any rhythm that you can add - Sabbath rhythm - to give some Kadosh time to your life will allow rest. You might need to turn your phone off. You might need to turn all screens off. You might need to cancel or step away from an activity for the kids. But if you can give yourself that rhythm of “engaged/disengaged” or “on/off” to give your land a rest, then God can work answers into your life that you might not have expected. How does the Shmita law and the idea of Kadosh relate to generosity and to giving? Well I think back to my sons’ rest. When they’re exhausted, they wake up grouchy at us because we didn’t pour their cereal in the right bowl or because I’m not delivering x, y, or z fast enough. When they’ve had enough rest, they wake up with gracious hearts and Jonny will offer to cook omelettes for us. Its not just the rest in his body. Its the rest in his brain. When we give our brains a chance to stop buzzing and to expect a time regularly to play, rest, and get away from the noise of this world, we can be grateful, gain perspective and grow in graciousness. it’s a journey, not going to happen overnight. Small steps, but the small steps can change lives. I’m taking small steps. We can all take those small steps. Small changes can produce big results too - Joshua Becker said, We were all created for something greater and better than this right here (material possessions). The pursuit of meaning is what makes us happy. Generosity goes hand in hand with meaning. Generosity can transform us. But that’s only true if we’re letting God transform us from the inside. I'm a portrait photographer and artist based out of central Pennsylvania. I often blog personal stories along with a mix of the stories of others. I think in sharing stories, we can see what brings us together. 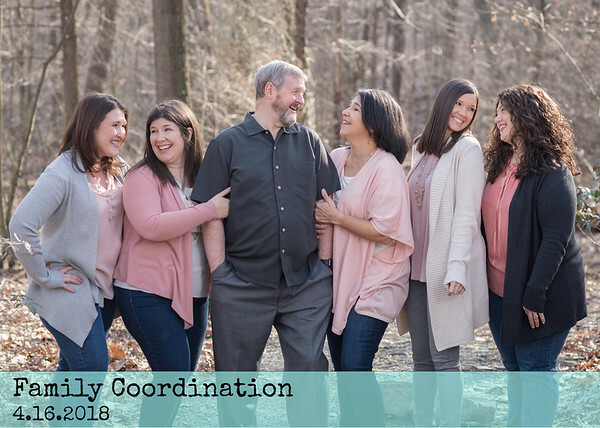 If you'd like to check out a recent blog story, the last one was Family Coordination.